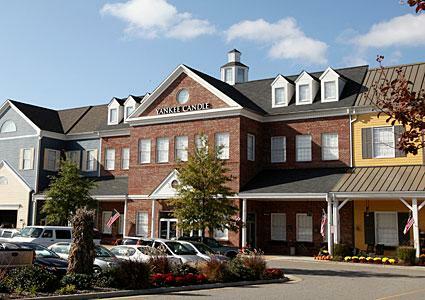 A visit to the Yankee Candle flagship store in Williamsburg, Virginia offers a wonderful opportunity to buy some of the world's most popular candles, but there's so much more to do. Find out everything you need to know. The first thing you need to know is where the store is located and when it's open. Sunday through Thursday, 10:00 a.m. to 6:00 p.m.
Friday and Saturday, 10:00 a.m. to 9:00 p.m.
Candles are the main attraction, and this flagship store stocks hundreds of thousands of them. You'll find all the newest scents alongside yearly favorites. You'll even find some of the classic scents that may be difficult to find at your local Yankee Candle store. Jars, tumblers, pillars, tarts and votives are all available, as well as the company's aromatherapy line, room sprays, fragrance oils and "car jar" air fresheners. Jar shades - These are some of the most popular accessories Yankee carries. The shade are made of decorative glass, and the rest on top of the candle jar to make it look like a mini lamp. Votive holders - You'll find a wide variety of these holders in many designs. One is sure to suit your home decor. Candle trays and holders - There are holders for nearly every type of jar or candle Yankee makes. There's even a large hurricane glass hold for your larger candles. Illuma lids - These ornamental lids are designed to rest on the top of your jar while the candle burns. Wax potpourri and fragrance oil warmers - Some are electric, while others are heated using a tea light. Yankee offers collections of these items themed for every season, as well as most major holidays. Shopping for candles is probably your top priority. However, there's a lot more to see and do because this isn't just a candle store; it's a village. Here's a sample of what you'll find as you explore the entire complex. This is a great place to learn about candle making, and you can actually try dipping your own candle if you like. You might also like to create your own jar candle, and you can even make a set of wax hands using your own hands as the mold. It's Christmas all year long at Holiday Park. This section looks like its own small town where you can visit with Santa and even watch it "snow" every few minutes. There's also an amazing collection of keepsake-worthy ornaments available. Watch Hickory, Dickory & Doc, the animatronic band, and grab a treat at Mrs. Claus' Bakery & Cafe. If the scents of candles like Chocolate Truffle, Buttercream or Cinnamon Stick make you crave something sweet, you can satisfy your sweet tooth with a treat from Dylan's Candy Bar. They have nearly every kind of candy, from jelly beans to chocolates. This is a great attraction for kids as well. Looking for something salty and sweet? This is the spot for gourmet popcorn treats. You can choose a single flavor or mix and match your favorites. There's nothing like a virtual tour to give you a better idea of what you'll find at the Williamsburg flagship store. Take a quick look right now. As if there's not already enough to keep you busy at Yankee Candle, you still might want to know about a few other nearby attractions that can really make the trip worth your while. This flagship store is part of Williamsburg's historic triangle, so it's close to Busch Gardens, as well as Colonial Williamsburg and Prime Outlets. With so much going on at the Yankee Candle store in Williamsburg, it's easy to see how a simple shopping trip could turn into a full weekend get away. Come for the candles if that's mainly what you want, but make sure to leave enough time to explore the other attractions in the store and beyond.